Like other Mazdas, the MX-5 now wears a permanent smile. 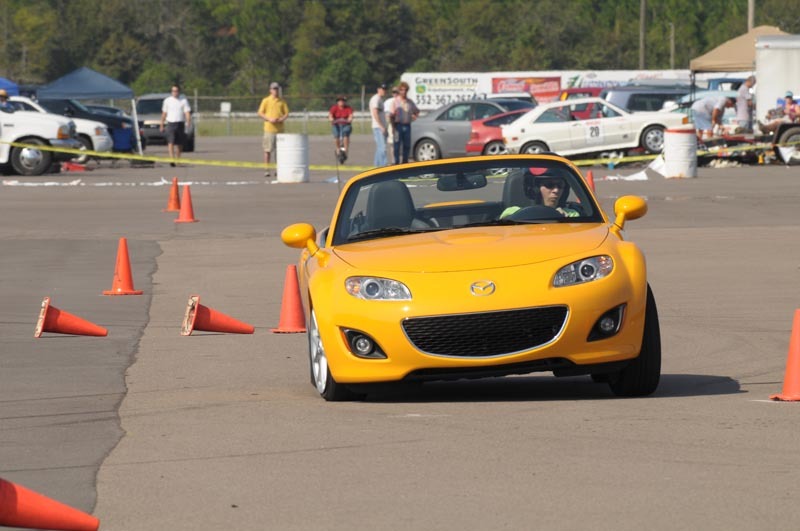 The 2010 Mazda MX-5 Miata felt right at home at the $2009 Challenge autocross course thanks to the optional Bilstein dampers and limited-slip differential. Better than: an MX-5 without the no-brainer $500 Suspension Package. But not as good as: rumors of the next-gen Miata being 200 pounds lighter. 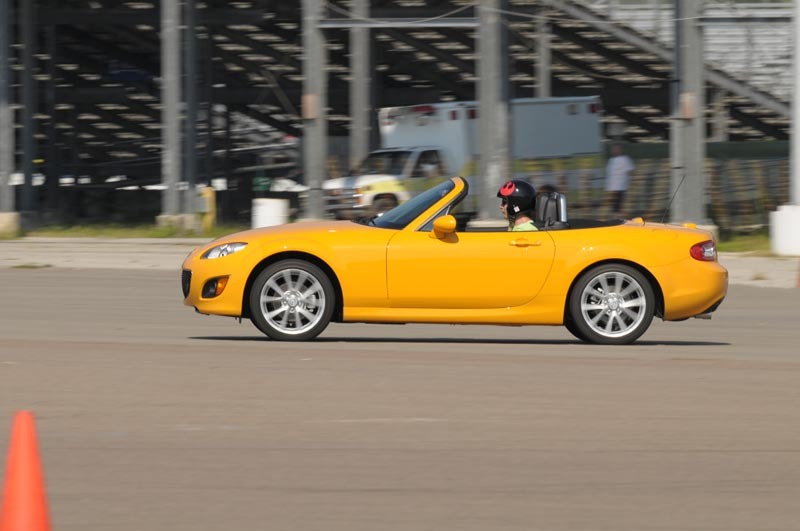 Shortly after the third-generation Mazda MX-5 Miata debuted for 2006, we got our hands on a very basic model and took it to an autocross. It rolled, pitched and wallowed to an excessive degree, and we feared that Mazda had gone too far in dumbing down our favorite bargain roadster. Naturally, the aftermarket provided plenty of ways to correct the handling, but that first impression always left a slightly bad taste in our mouths. The MX-5 got a face-lift for 2009 that incorporates Mazda's new smiling corporate grille. Just a couple days before our $2009 Challenge, another Mazda MX-5 press vehicle came to our headquarters. We figured it would be a perfect way to get to and from the event, and we'd be able to have some fun in it, too. As a top-of-the-line Grand Touring model, this example had automatic AC, heated leather seats, a Bose stereo and some interior trim enhancements in addition to the regular Touring package's six-speed transmission, strut tower brace and other amenities. That's all lovely, but what blew us away was the Suspension Package. A sport-tuned suspension that includes Bilstein dampers and a limited-slip differential totally transformed this car from the wallowing pig we had experienced back in 2006 to a sharp, delightful corner-carver. Best of all, the package is just $500; don't leave the dealership without it. On its OEM street tires, this bone-stock car ran a 34.670 at the autocross course we had laid out for our $2009 Challengers. This would have been good for 33rd place, but subtracting 2 seconds for hypothetical R-compounds would have put it in the top 10 at the autocross. It was a heck of a lot of fun at the limit, too, with fairly flat handling, thrilling power-on oversteer and ultra-communicative brakes. It ate up the miles on the highway, too, and the slick single-latch manual folding top can be raised and lowered from the driver's seat with just one arm. There's not a ton of room for luggage, but hey, it's a Miata. The six-speed transmission is fun to row, although it required a bit of concentration to get from second to third on ultra-fast shifts. Dressed in Competition Yellow, this MX-5 is every bit the ray-of-sunshine sports car that can transform any commute or errand into a little driving adventure. Until I drove this car, I was content with thinking that the best days of the MX-5 were behind it. Even the tuned examples of the 3rd generation Miata left me a little cold, but this one made me reconsider. It felt light on its feet and had adequate, if not inspiring, power. The interior still offered the comfort that was so improved with this generation as well. Even the well-optioned example we used seemed eager to dive for an apex, with a suspension that inspired confidence and made me want to keep my foot planted against the firewall. The ergonomics and visibility reminded me exactly what Pontiac and Saturn got wrong with the Solstice/Sky twins. The MX-5 remained civil and cozy without feeling cramped. Even with all of this praise, I have to balk at the pricetag. Find a way to trim about $5,000 and a few hundred pounds from the bottom line and I'd consider leaving my 1994 Miata behind. Tested at almost $30,000? Ooooff! Looks like I'll have to wait a few years. Don't forget, our test cars tend to come loaded. We don't get to pick their configuration. The Sport starts at $23k. I don't think anyone is paying sticker for these cars - sales are way down, and there's still a lot of negotiating to be done at the dealer. I got a great deal on an '09 by waiting until October to buy. I assume that there are more good deals to be made while the weather is bad (at least in the northern states). There were a bunch of engine and suspension tweaks (in addition to the cosmetics) for '09. That, as well as the suspension package, may account for some of the improvements felt by the reviewers. As I've said before, Less is More and in this case, more weight and size makes the car a lot less fun. I drove a Grand Touring, and a couple of different option setups. I even took a new Sport model home for the weekend and tried to make it seem like as much fun as my, then stock '02LS. What I discovered is I liked my '02 stock better than any of their new cars stock. So I put a little money in my '02 and don't plan on shopping again till they shrink or replace the NC model. nderwater noted Miatas aren't selling as well as they used to and no one is paying sticker. Perhaps a good diet & more buffed look would turn that around.